May 2019 Location to be determined! You are invited to a unique and memorable experience, immerse yourself in the study of Advanced IA & Medicine Wheel Feng Shui. Making medicine wheelsand gaining wisdom from the 4 directions. The course also reviews all the info in the most recent RED BOOK, including our unique bagua for the Southern Hemisphere. In addition this course adds another certification in Medicine Wheel Feng Shui a different and powerful way to work with clients and their relationship to their home. It is based in four elements and the four directions and allows you to help clients find their elemental clan and create a home for their soul. I believe the world needs Interior Alignment® practitioners; today than ever before. As a feng shui practice that honors native traditions of all lands, understands 21st century living and health home practices, we are the best at making each home a sacred space! While the 'feng shui' trend is back on the rise, according to Hay House, and there is a significant rise in conscious living, and Interior Alignment is the system positions to assist people in this way. Medicine Wheel Feng Shui with it's more commonly understood four element system, connects with people at a soul level, and works well in creating a consultation practice that is both unique and powerful. The Advanced Interior Alignment® certification program is a 5 day training expanding on the core of your Interior Alignment practice. The first section of this advanced course expands your connection to nature though sound, scent and pattern. The Synchro-Alignment® processes in this section provide profound journeys for your growth and connection to the divine. You will truly be stepping into the role of the shaman, through shape shifting, and connection to all the element of nature. You will learn powerful journey to take your clients on to allow them to deepen their connection to their home, and their guides and guardians. Your awareness will expand and deepen as you delve deeper into the art of client rapport, connect even more deeply with the energy of the earth, the air, the water and the fire. This course was written by Denise Linn, based on her best selling book 'Feng Shui for the Soul', with deeper inner work, invoking the process of more shamanic work and phenomenal methods to bring this information to life. The second section of this course is teaching you specially how to perform a Medicine Wheel feng shui approach to a home or business. This certification in Medicine Wheel Feng Shui. This method uses the energy of the four elements to understand and harmonize a space, providing a new and powerful methods for doing consultations. This is a unique, simple and powerful technique to use with clients who might not be interested in the traditional 5 element and Bagua approach, but connect more deeply with a four element system, and the cycles of nature. have been working closely together since 2003. LuAnn has been a leading member of the Interior Alignment Foundation Council since appointed by Denise in 2004. She has been teaching her own certification programs since 2004, and has assisted Denise at many courses such as the Weekend of Miracles events, Hay House I Can Do it events, and at the San Diego and London Soul Coaching Oracle Card Certification Program. LuAnn and her team organized the Interior Alignment Feng Shui conference of 2007, 2009, 2015 and 2017, as a platform for IA Practitioners to shine. She is passionate about the empowerment of Interior Alignment Practitioners, and especially is supportive of her students and graduates and their work in this world. If you are interested, please email me to be placed on the list of wonderful souls to be contacted when the details are finalized! "The training was FABULOUS, DEEP, INNOVATIVE, ANCIENT, JOYFUL, HEALING AND MORE!!!!! I loved learning it all and had a fun week. LuAnn's training helped me clearly see how to strengthen my weaknesses and increase my wisdom and strengths in turn helping my clients more. I had many Ah Ha moments and attribute that to LuAnn's intuitive ability to tune into my needs and my vision of my path. The whole week, many questions I had and ideas seemed to fit together like a puzzle which amazed me. I gained greater clarity and empowerment due to the program and LuAnn's teaching abilities. Denise's new material of Advanced Interior Alignment and the Medicine Wheel Feng Shui is fascinating, brilliant, useful, innovative and yet incorporates very ancient wisdom. She has very generously shared her vision and knowledge through this material. Many, many tools and info are given in this training. I can see my clients benefiting from these methods and I certainly did immediately. I have already applied some AIA and Medicine Wheel Feng Shui in my laboratory - my home! Denise's new material and LuAnn's teaching of it took me to a deeper level of understanding nature, energy, guides, Synchro-Alignments, how to help my clients and on and on. I loved learning the shamanistic journey and I adore my beautiful, powerful Native American drum... a gift from IA. My already close connection to nature just got deeper and even more magical. I have come out of this training a new person with new strong tools to work with. I feel more powerful which is a blessing. 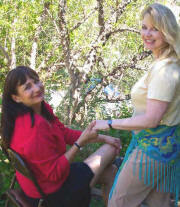 I am so grateful to Interior Alignment and Denise Linn and to my teacher LuAnn. Thank You, Thank You! "